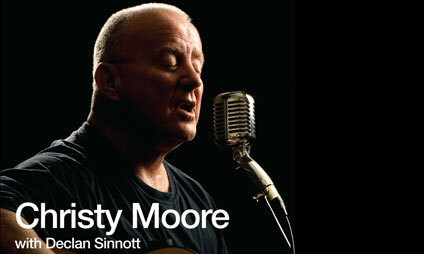 Christy Moore has announced that his new album Folk Tale released on 28th October, 2011 Produced by Declan Sinnott, Folk Tale is the latest result of Christy and Declan’s unique musical alliance. Their long collaboration has gained a loyal and ever increasing following. Folk Tale will be released on the Columbia Label (Sony Music), whose association with Christy dates back to 1995. He enjoys being a Columbia Artist as they made many of the cowboy films he saw at The Palace cinema in Newbridge in the 1950s. The album features 11 tracks and Christy hopes that there will be something here for everyone. One song argues that God must be a Woman, another describes a Flight to Freedom. There is a song about The Singing Priests in the Phoenix Park and a song about a bunch of Tulips in Amsterdam. Elsewhere the songs tackle a wide range of subjects: a murder in East Clare, the Choctaw Indian people coming to Skibbereen, a eulogy to a Mode of Transport in Kildare, and nights spent out in The Naul. There are words from Paula Meehan (the Poet of Dublin) and a song of Tipperary, and from Lancashire comes a beautiful (yet terrible) song called Morecambe Bay. Other players joining Christy and Declan on the recording include Gerry O'Connor, Tim Edey and Neil Martin with The West Ocean String Quartet. When he wasn't making his new album Christy was busy with a host of activities throughout the year. July saw the broadcast of One Night Only with Gay Byrne on RTE 1. Christy's first appearance with the iconic broadcaster on The Late Late Show was in 1972. 39 years on, he discusses and sings eleven songs, many of which had not been performed on TV previously. That month he also joined rock band Coldplay onstage to duet on Jimmy McCarthy's classic "Ride On" at Oxegen. Christy reckons that this collaboration began when then 12 year old Will Champion (Coldplay drummer) attended a Christy gig in Southampton in 1992. Rough Guide recently published a Rough Guide to Bob Dylan. It contained a list of their favourite Bob Dylan covers and featured two recordings from Irish artists; Sinéad Lohan's recording of "Ramona" and Christy's recording of "The Lonesome Death of Hattie Carroll". What was overlooked was the fact that both recordings were produced by Declan Sinnott – a fantastic tribute to the work of the Wexford producer and musician. 2011 also saw the release of the Come All You Dreamers DVD, a recording of a gig from Barrowland Ballroom, Glasgow in 2008. Christy has developed an affinity with this old venue since he first appeared there 30 years ago. Along with Declan and his manager Paddy Doherty he produced this film that captures the work as he loves to do it, in a raw, atmospheric and very real setting. It has received repeated prime time transmissions from both TG4 and BBC4 as well as being available on DVD. The recent edition of the Penguin Book of Irish Verse includes Christy's 1983 classic “Lisdoonvarna.” Its inclusion in this prestigious anthology came as a total surprise. Christy first performed the song at the 1983 Lisdoonvarna festival. He subsequently recorded it on his 1984 album Ride On and the song has gone around the world and home again.